At the recent IACT/IMDHA Annual Conference and Hypno Expo in Daytona Beach, Florida, The International Association of Counselors and Therapists (IACT) gave our very own Director of Education a huge accolade. 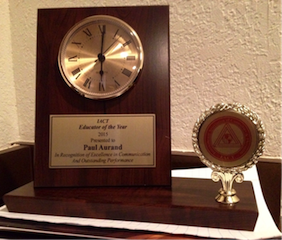 Paul Aurand was named as ‘IACT Educator of the Year 2015’. Many current TNI members have in the past been amongst Paul’s students, and will understand from personal experience why Paul is so deserving of this award. So we want to share this great news with all our members and invite everyone to join together in offering our sincere congratulations. We are all proud of you, Paul!